In the middle of the Alpine Garden, if you take the little bridge next to the waterfall, you will see a dawn redwood (Metasequoia glyptostroboides) on your left. It doesn't seem very spectacular. 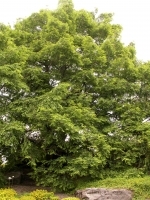 But this is a specimen of the only living species of the Metasequoia genus, considered a living fossil. Dawn redwoods were discovered in China's Sichuan province in 1941. In 1948, Harvard University organized a seed-collecting expedition. Plants grown from these seeds were distributed to various arboretums and botanical gardens, including the Montréal Botanical Garden, of course. Cuttings were taken from the specimen we received and planted in various spots around the Garden. The one located in front of the Administration Building died after a few years, but some of them have survived. This one in the Alpine Garden is an attractive specimen, standing about 8 metres high. It probably appreciates the protection it gets in this garden with its little mounds we call the Alps and the Rockies. It doesn't grow very quickly, mind you, and it's always very sensitive to freezing temperatures. But it deserves our respect and it's certainly worth going out of your way to see a tree on the IUCN (International Union for Conservation of Nature) Red List of Endangered Species. All that being said, though, it is not the rarest tree in the Garden. 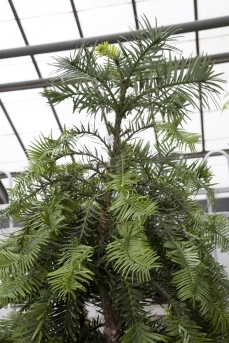 On May 22, 2007, the International Day for Biological Diversity, we were proud to add a Wollemi pine (Wollemia nobilis), the world's rarest tree, to our collections. The discovery of a new plant species, in 1994, was certainly an important event – but when the tree in question was so unique that scientists had to come up with a new genus, that was truly extraordinary! It does not belong to the genus Pinus, nor to the pine family (Pinaceae), but rather to the Araucariaceae family, in which there were only two living genera, Agathis and Araucaria. The Wollemi pine, with fewer than one hundred specimens growing in the wild today, can be considered the world's rarest tree. It is now the subject of an ambitious conservation plan. The sale of young trees to parks and botanical gardens around the world, including in Montréal, helps to safeguard this tree and other rare and endangered species. The Montréal Botanical Garden specimen, being fragile, is currently in the collection area. It should be presented again to the visitors in 2011.